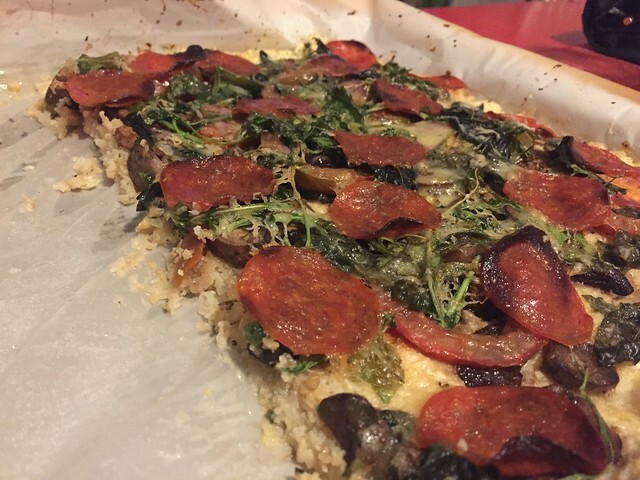 There’s several cauliflower pizza recipes out there, but my version doesn’t use tomato sauce because I don’t want my pizza to be soggy. Using one egg binds the ground cauliflower, but not so much that you can actually fold it and eat it like a pizza–you’ll still need a fork to eat this, and perhaps a spoon to scoop everything together. What I like about this recipe is how you can play with different toppings. Sure you can use mozzarella instead of Parmesan, but I wanted a hardy cheese that won’t get soupy. I had extra Gruyere in the fridge and so I decided to grate that over the rest of the toppings. Arugula leftovers? Sure! You can also leave this as a vegetarian dish and skip the pepperoni, but where’s the fun in that? 1. Preheat oven to 425º and line a baking sheet with parchment paper. 2. Using a food processor, quickly blitz cauliflower florets. Do it in 2 separate batches if necessary. Transfer to a large mixing bowl. 3. Combine ground cauliflower with the egg, Parmesan cheese, and season with salt and pepper. Lightly mix with a spatula. 4. 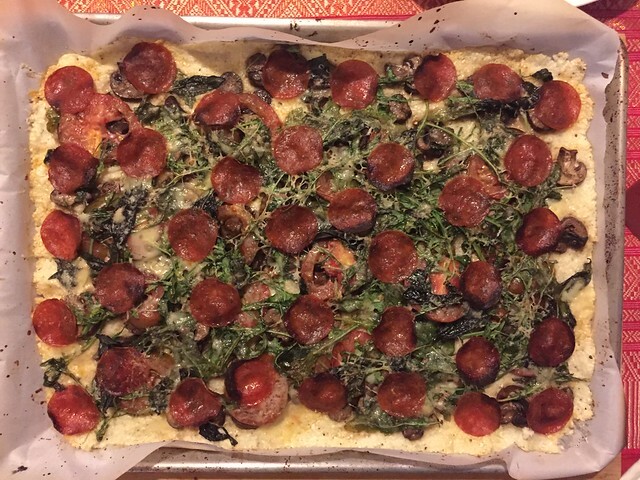 Spray the lined baking sheet with non-stick spray and pat the cauliflower mix flat onto it like a rectangular pizza. Spread evenly with the spatula. 5. Grate the Gruyere over it and top with the rest of the ingredients. Drizzle some oil and bake for up to 18 minutes, or until golden on the edges.